According to Trend Micro, crooks in Asia are conducting the sextortion practice to the next level, including the used of mobile malware to get huge profits. 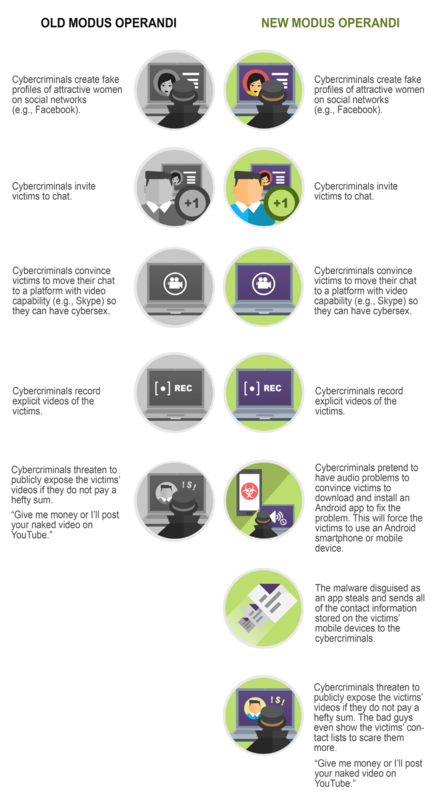 Trend Micro released a new report to bring to light a criminal activity known as sextortion. Unfortunately sextortion is a common practice in the cyberspace, but experts highlighted recent innovations observed in this kind of illegal practice. In a recent case observed in Asia, a crook posed as a woman, chatting with male victims on several chat services, like Kakao Talk, and setting them up for blackmail. The attacker improved the efficiency of the attack convincing the victim into download and install a malicious mobile malware, an Android data stealer. In the end, the victim is threatened by the cyber criminal which requested the victim to pay $908.02. In this scheme, the Android data stealer is used to steal sensitive data from the victim’s mobile device, including contact list, to enforce the blackmail and mare more effective the sextortion. One thing to note too, is that the process of extortion is evolving as so the development of malware. “…certain gangs in East Asia have improved on the sextortion modus operandi, creating a far more damaging effect on the victims,” “The new modus operandi involves Android malware that can steal the victims’ contact list and send them to the attackers. Attackers are then able to contact the victims’ families and friends directly—making for a more intimidating threat.” continues TrendMicro. The Android data stealer allows attackers to be very aggressive against their victims by accessing their personal data, intercepting and logging the incoming SMS, preventing them from receiving calls. The sextortion phenomenon is rapidly expanding all over the world, even if the TrendMicro’s report focuses on crimes occurred in East Asia, there are many other cases of sextortion in Canada and US.